A case study of how I helped a First Aid Training Centre bring all its operations online. 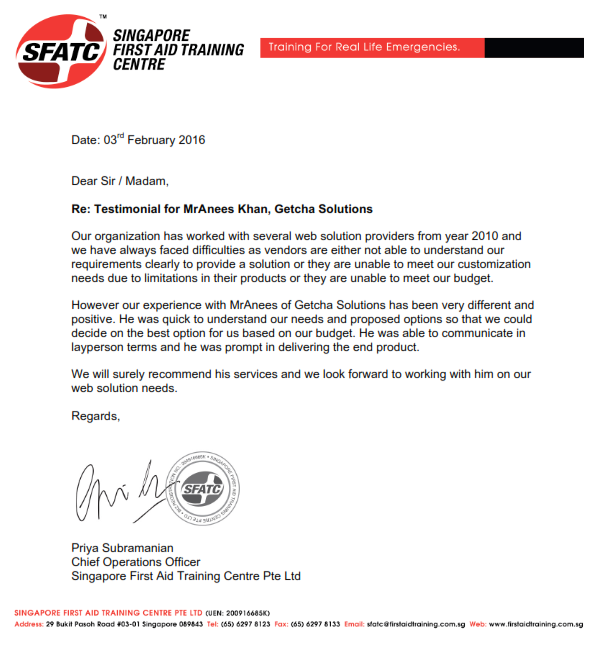 In this page, I explain how I helped bring Singapore First Aid Training Centre Pte Ltd (SFATC) with bring all its previously-offline business operations and workflow into online operations, including first aid training and grading of students. With this, I hope to shed some light on how YOUR business too can go the same path and bring itself to the next level, technologically. SFATC wanted to achieve these following objectives and have these following features and requirements. All the mentioned features were successfully implemented. Details and screenshots are provided below. The features screenshots are currently undergoing a revamp for better display. Do contact me directly if you need more details. A secure login system. No unauthorised person to have access to it. The above system is what I built, ground-up, for a First Aid Training Centre. It was developed to their EXACT, UNIQUE needs, after discussion of their requirements and operational workflow.